How to choose front page and blog page? How to use Top bar setting? Before you install Sleeky Pro, it's important to know a few things before you begin. Sleeky helps you out by giving you a premade child theme that you can install. This is found in the original downloaded package with an installable Sleeky-child.zip theme file. You would simply install this like any other theme, then activate it. It's important to know that before you do this, make sure that the parent theme (Sleeky) is installed. Activate the sleeky Pro and Click on “Customize” in the Appearance Menu in the Dashboard. To edit the content of theme. Copy the files inside "sleeky-pro" folder from the zip file of the latest version of Sleeky Pro Theme. Sleeky Pro offers several features, but some require plugins if you decide to use them and should be considered as optional. You will need to download and install these because they are not included in the download of this theme. We do this so that everyone can choose which plugins they want to install, but it also ensures the most recent version of each plugin is installed. You can find all the plugin list when installing the theme as a notice in the top area. Jetpack - This gives you an amazing features to control widget visibility, comment form, extra widgets etc. In Additional Sleeky pro comes with Revolution Slider bundled, you can find the slider plugin file in the theme package folder. After you complet the above steps you need to select the stactic front, so for it you can follow this tutorial. Same as above you can use TOP 2 and TOP 3 widget for other. 2. After that if you want to change the color of Top Bar then you can get all the option there. Add or change the content here to change the top heading part of all pages. In dashboard click FAQ post type then click add new and add title and posts. Add any numbers of FAQ you want. Then Crete new page and in editor section paste this shortcode [style_faq total="8"]. The number 8 is the number of post to show, So you can edit this number accordingly. In this tutorial i am going to show you how to create a page which is similar to the demo of sleeky pro theme. if you follow the process step by step you will be able to create your site as the demo. Create a Page: First you need to create a page and assign the template to homepage. Go to Reading and set the static page to the page you recently created. On the left hand side "Sleeky hide Titles" Metabox click on the hide page titles and update the page. You need to use a page builder such as siteorigin page builder which is free, and insert the sleeky Recent Blog Posts widgets to the page. You can now go to Appereance->Widgets and add CTA widget, Top Widgets, Content Bottom Widget, Inset full widget as per your choice. 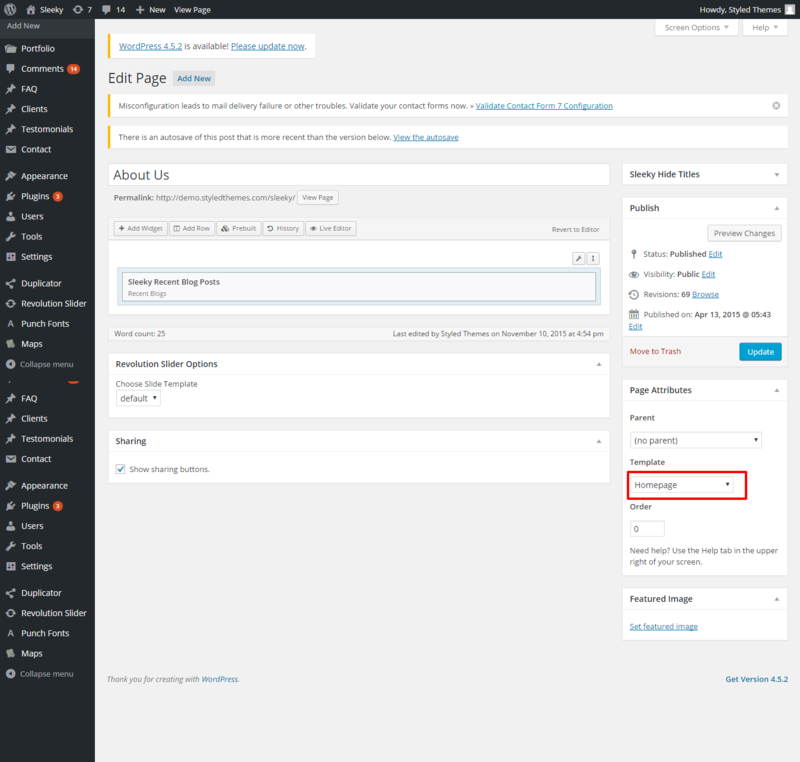 Use the Jetpack Visibility Plugin to make sure to show them only on home page. Your home page is ready. if you find trouble creating the home page, you can ask us for the demo content for the homepage, we are happy to provide it.